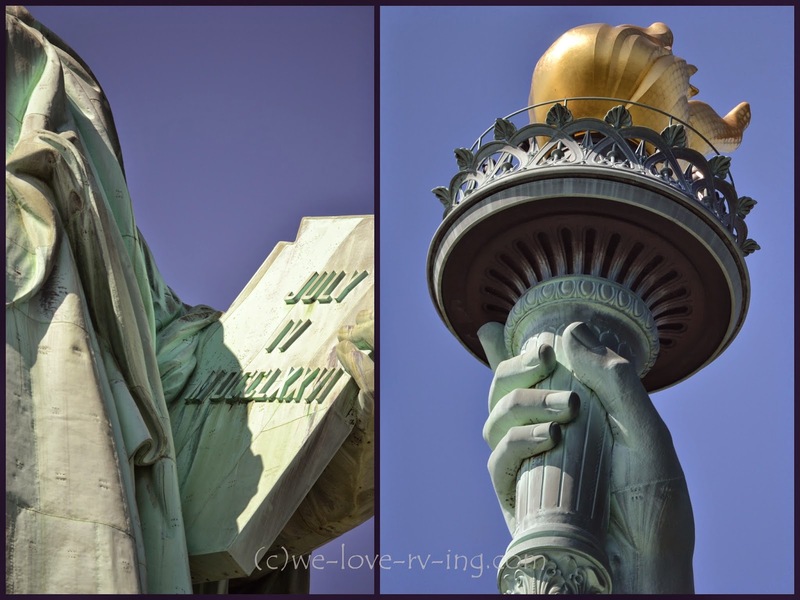 The Statue of Liberty and nearby Ellis Island have both left their marks of history during the years of immigration by millions of people from the old world to the new world in the United States. 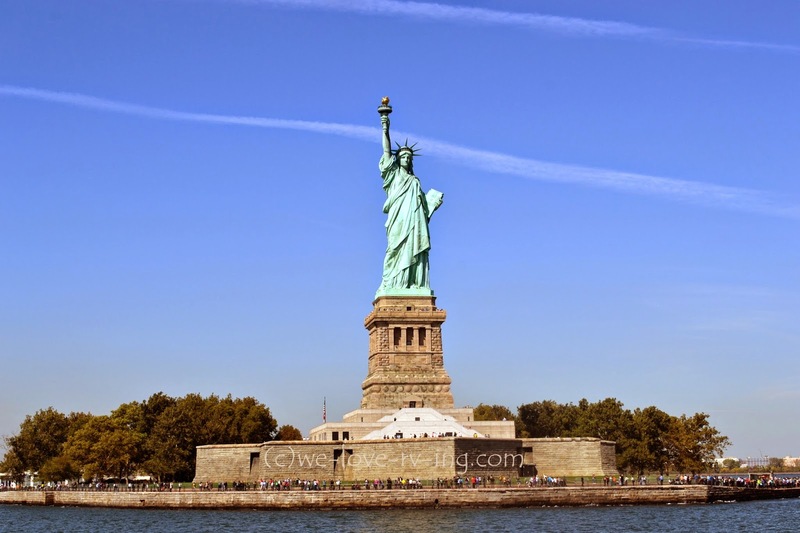 One of the greatest sights to see when visiting New York is the Statue of Liberty greeting all visitors in the harbour. The many photos taken does it no justice as it does when we take a ferry ride to get up close to the Statue and seeing it in person. 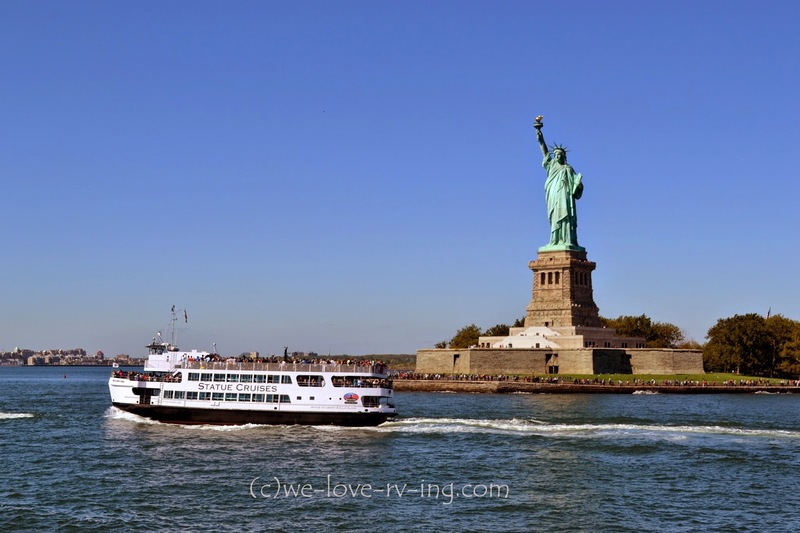 One might choose to take a tour boat that will bypass both Statue of Liberty and Ellis Island but give a view of both, and we did take that first as part of a tour package. We chose another day to take the tour with the Statue Cruises for a close up look, as did hundreds of others that same day. The tickets are available in the old fort. As with many popular tours, there are line-ups, especially on a beautiful sunny day in October. We stood in different lines throughout the day that may have added up to at least three hours. The security is similar to the airport when taking the Statue Tours. The trip was well worth it but one must factor the line-ups into their time when visiting these sights. 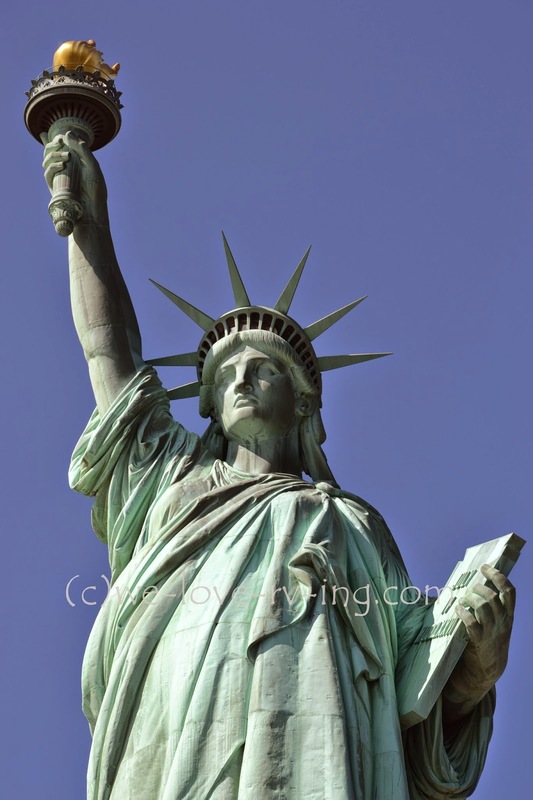 The Statue of Liberty was a gift of friendship from France, a symbol of freedom and democracy, dedicated Oct. 28, 1886. The French paid for this sculpture by donation from the people of France from the private sector. Then when the necessary funds ran out before the base was constructed, Joseph Pulizer, the publisher of a New York paper, appealed to the people of America to donate money to pay for the pedestal and dollar by dollar, they raised the necessary funds. 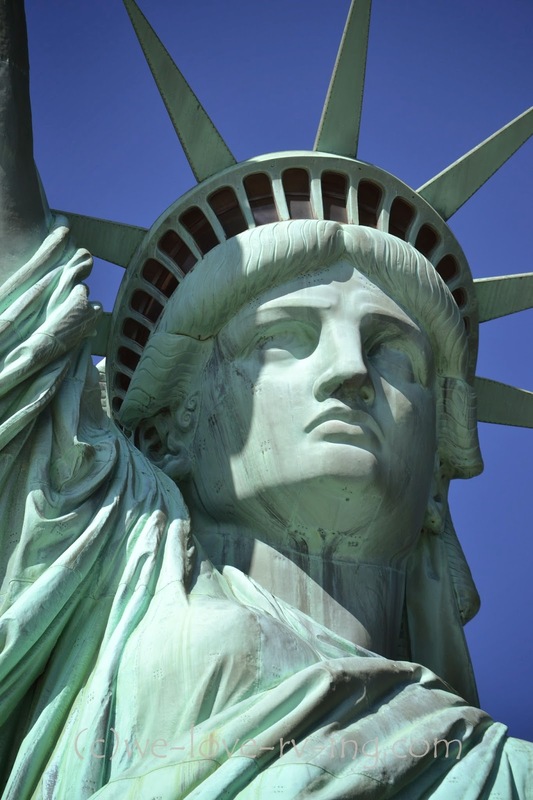 Frederic-Auguste Bartholdi, a French artist and sculpture designed the Statue of Liberty. The story says that this beautiful face was that of his mother. There was a time that one could go right to the top for the view but that has changed. You can get crown tours if you book far enough in advance. These tickets also give you priority on the Boarding Queue for getting on the ferry, which might make the extra expense well worth it. The tablet in the hands of the Statue has July IV, MDCCLXXVI inscribed on it, which is July 4, 1776, the date that the Declaration of Independence was signed. The tablet is over 23 feet long and 2 feet thick. The upkeep of the Statue is taken care of by the National Park Services. The torch is copper covered with 24K gold leaf and is lit up at night by floodlights. There was access to the torch when it first opened but that was closed in 1916. That would have offered quite a view. Alexandre-Gustave Eiffel was the French architect who designed the 92’ tall pylon to be the primary support structure of the Statue’s interior. The elasticity of the design allows the Statue to sustain all weather conditions. The total height from foundation to the tip of the flame is 93 metres (305’) and weighs a total of 450,000 pounds. The thickness of copper that covers the structure is only the thickness of two pennies, making a total of 60,000 pounds of copper used. 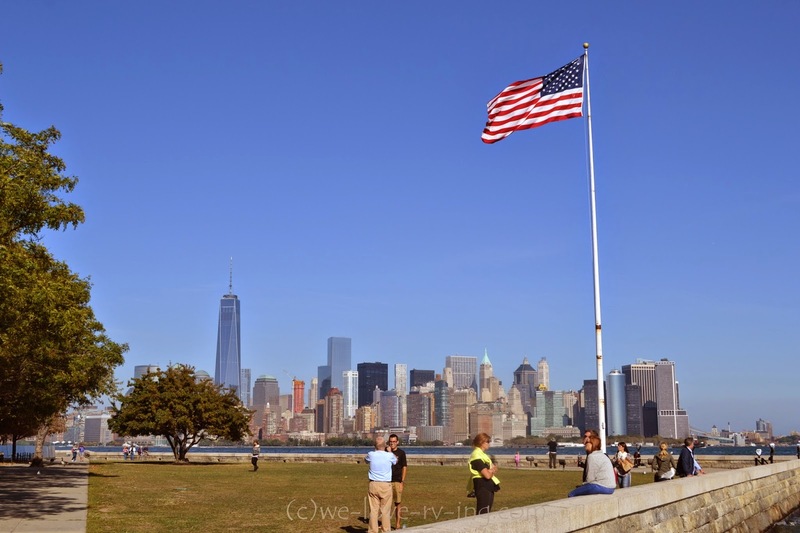 We once again braved the line-ups to wait for the ferry to pick us up and take us over to Ellis Island where we would see the immigration history. 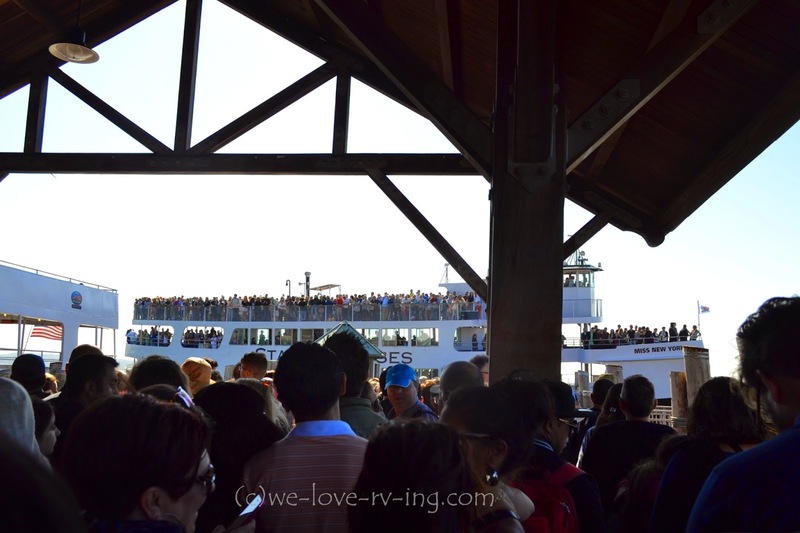 One can come and go on any of the ferries of the day; there is a passenger limit and we are counted as we enter, so one may have to wait for a second ferry, which did happen to us leaving Ellis Island. The crew are very efficient and keep everyone moving. Ellis Island was the gateway for millions of immigrants entering the USA causing this to be the busiest immigration station from 1892-1954. The first day, January 1, 1892, there were 3 large ships with 700 people and by the end of the first year there had been 450,000 people pass through this immigration center. By the time the Immigration Station closed in 1954, there had been 12 million processed here. 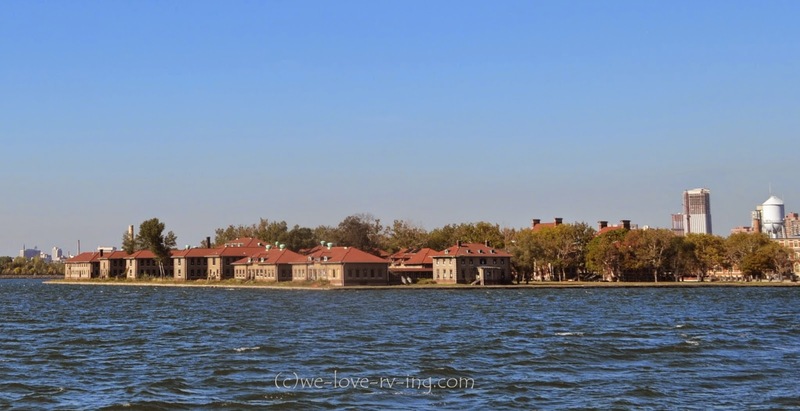 The south side of Ellis Island is home to the Ellis Island Immigrant Hospital. Immigrants with visible health problems were detained and put into the hospital on Ellis Island. More than 3000 people died while being held in this hospital. 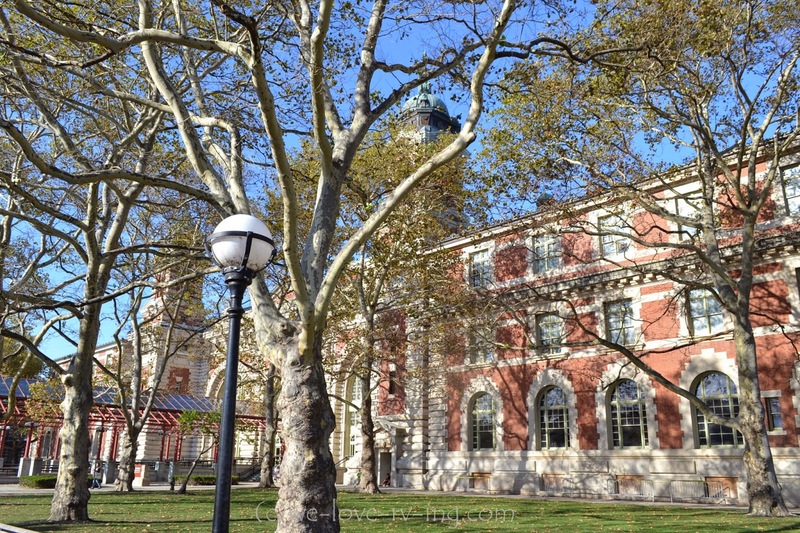 Tours for Ellis Island are also available but tickets need to be purchased ahead of time. 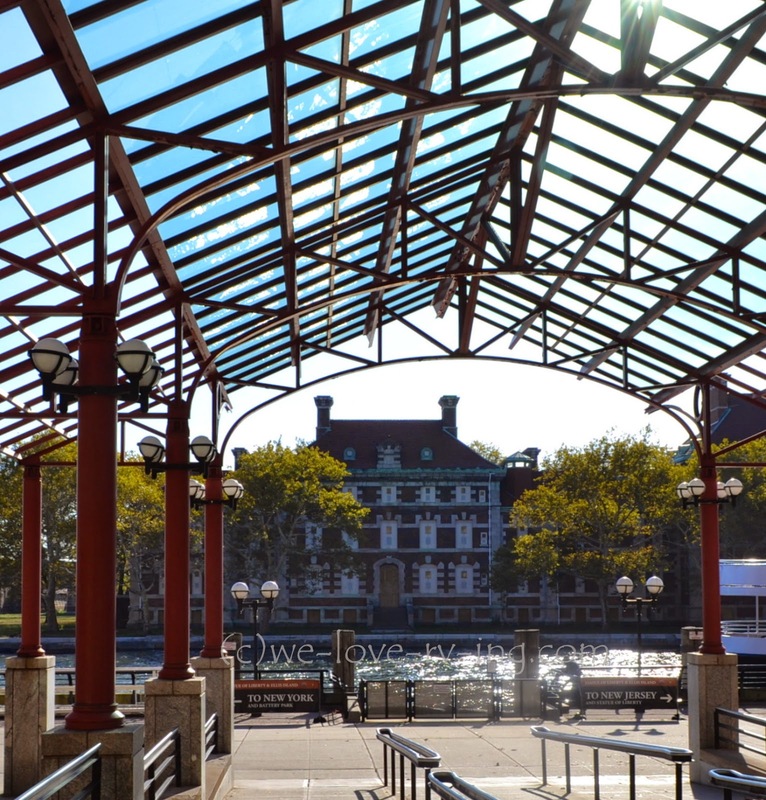 They offer tours of the Ellis Island Hospital including the mortuary and the autopsy room so the tour isn’t for anyone under 13 years of age or in my opinion, faint of heart. There is ongoing restoration being done to the Hospital and outbuildings so that there will be more to see on these tours in time. The building is now home to the Museum of Immigration and has been since 1990. We walked through and read a lot of the stories that brought these immigrants to the USA. There is a very colourful and interesting history that makes it what we know today. Around behind the museum is the Wall of Honour, where names of many of those who arrived here are written but we understand it is only a partial list. 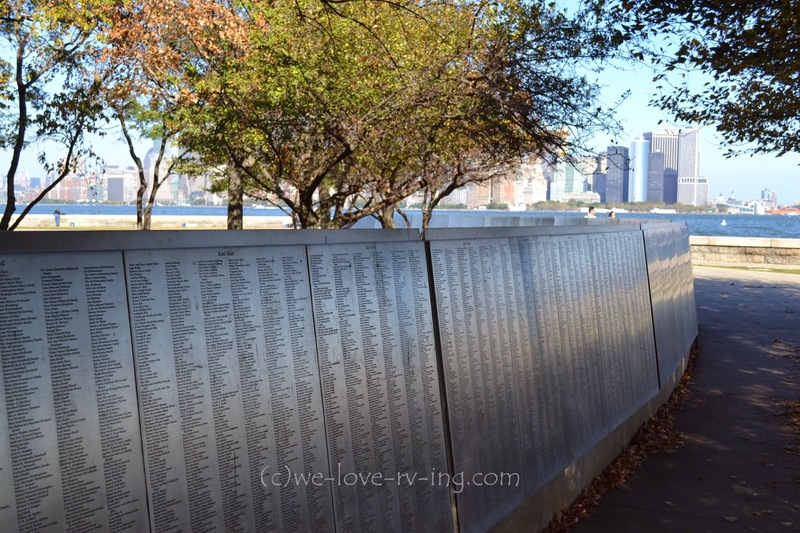 The Wall went on forever but 12 million names would go on for miles. We found some of our family names, although we do not believe them to be direct ancestors, it was interesting to see how many of them with our same surnames arrived here. Today there are over 100 million Americans who can trace their ancestry to those who first arrived in America at Ellis Island. 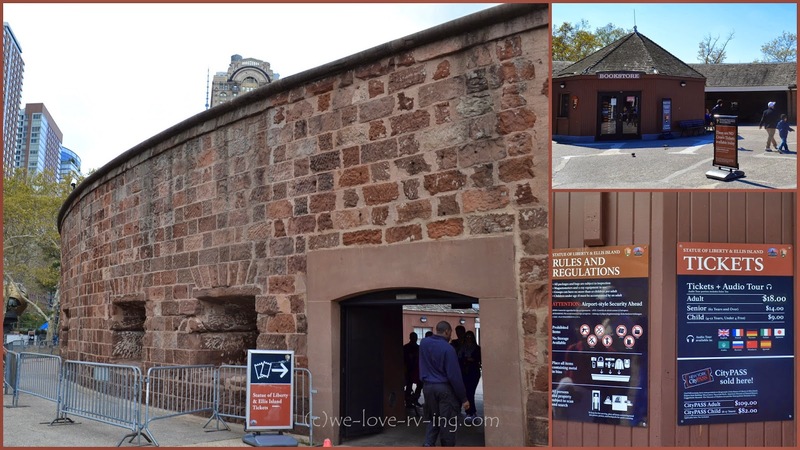 Ellis Island had once been one of Fort Gibson that was built to defend New York City from enemy ships that was approaching the Harbour. They were part of the triangle which included Liberty Island and Governor’s Island for 100 years before Ellis Island became the Immigration Station. The view of Manhattan Island of New York, the subject of Fort Gibson’s protection lies beyond. Our adventures today definitely gave us a history lesson that showed what many people had to go through to survive then make that long voyage to America. One cannot leave here without some appreciation for those sacrifices and the opportunity to learn and visit where it all began. It was a great day, even with the line-ups. Visit other New York sights by clicking here and here for more.